Avail Exciting offers on group bookings. For More info & Reservations: 080-49333000 / 9008979977. Venue: Nolimmits Lounge and Club, Opp. to Garuda mall, Ashok Nagar-Bangalore. “Mashup Monday” Ft.DJ Kamra. 30% Discount on The Bill. 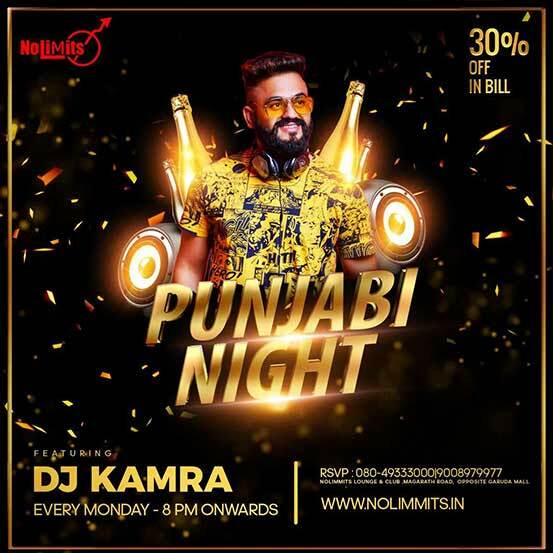 Nolimmits Lounge & Club presents you “Mashup Monday” Ft. DJ Kamra. 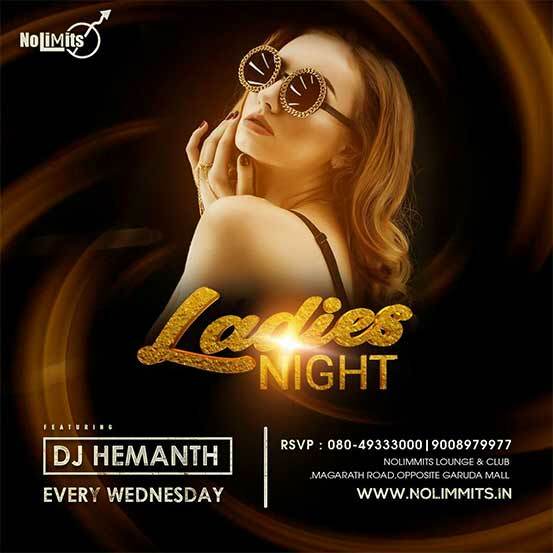 The awesome Dj Night on every Tuesday’s at Nolimmits Lounge & Club. “Mojito Night” Ft. DJ Vcky. 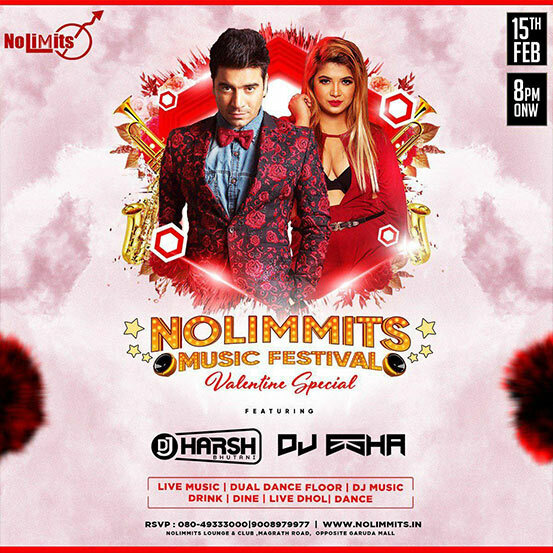 Introducing ‘Nolimmits Thursday’s’ Ft DJ Abby & DJ Sudipa at Nolimmits Lounge & Club. The Brand New Thursday Series. 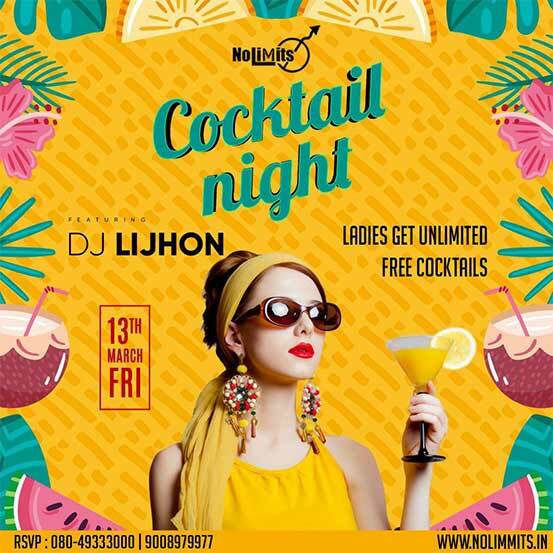 “COCKTAIL NIGHT” Ft DJ Ravi. The Classiest Friday Event. 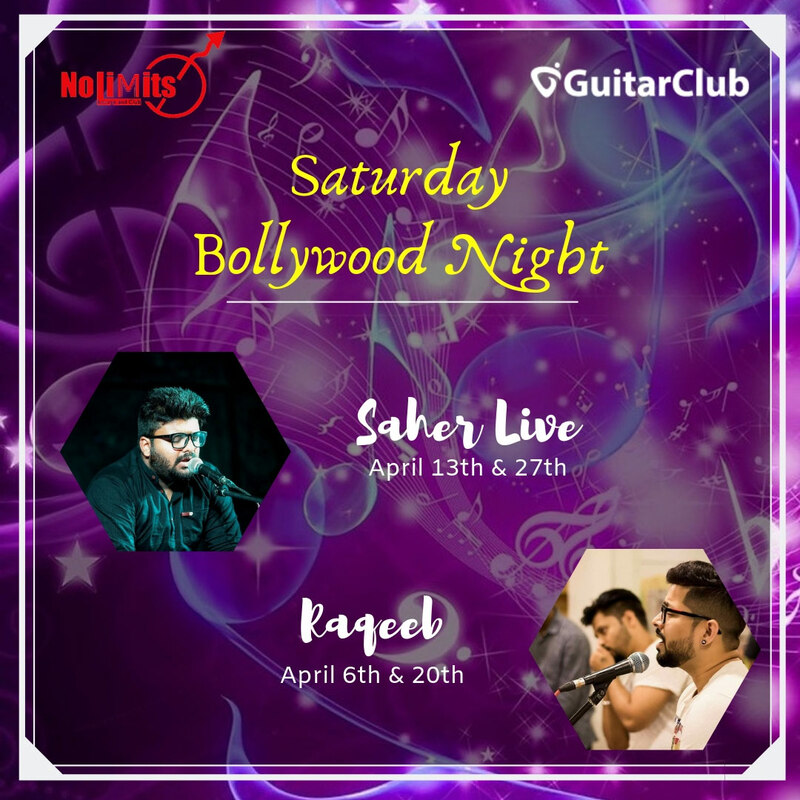 The Super star duo DJ’s from Mumbai Spinning the Best of Bollywood, House & Commercial Remixes all night through and have a great dine-in with yummy food & Choice of Drinks. Join us with your friends & family for the Exciting Saturday Night event in Town Have your dancing shoes on & enjoy the Spectacular DJ event. Make this ‘Music Festival’ Night a very special one!!!!! “DESI SUNDAY ” Ft. DJ Esha. A Night of Bollywood Music. 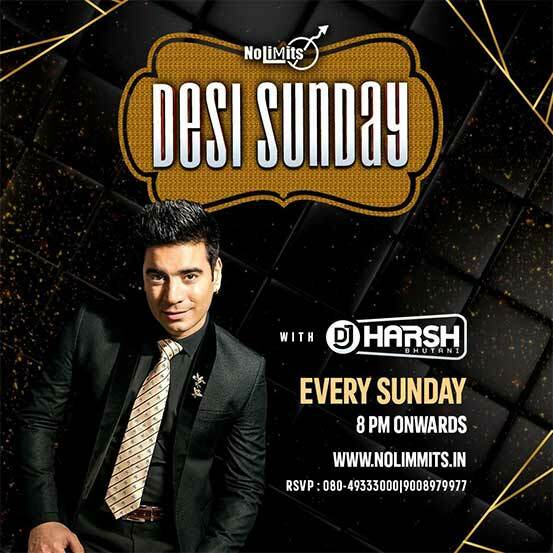 The Power packed Sunday event “Desi Sunday” Ft. DJ Esha at Nolimmits Lounge & Club. 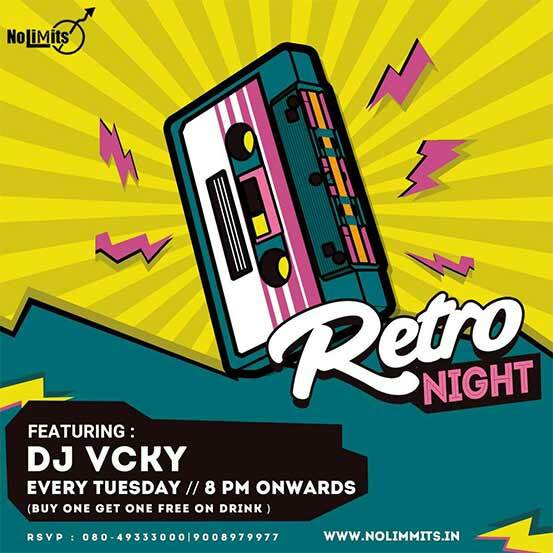 Dear All, Day time can be better with “HAPPY HOURS” at Nolimmits Lounge and club. Have a Business Talk over a Drink Or Kitty Parties! !At the Classiest Place Including open air space & VIP Lounges. Time: 12:00 pm to 6:00 pm. LOOKING FOR A FABULOUS PARTY PALCE IN THE HEART OF THE TOWN BANGALORE!!! 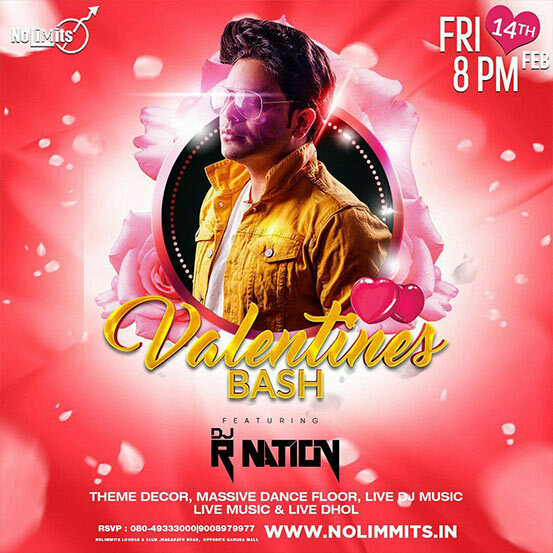 NOLIMMITS LOUNGE & CLUB is Located in the Heart Of the City Bengaluru!! Opposite to Garuda Mall on Magrath Road Near MG Road. No Limmits Lounge & Club is considered to be the Hot spot “Party Hub” In Town. Its motto is ‘One people. One tribe. One zone’. The interiors are classy with small LED lights running all over the ceiling. The place sets no limits for your expectations and it promises to deliver. It consists of two floors with an elite open air lounge. A DJ playing tunes to which the crowd can sing along keeps the adrenaline pumping. The menu is well crafted with the right mix of veg and non-veg fare to cater to the crowd. The Bar menu also boasts of some fine imported brands for customers to choose from. Offers special booking options for private and corporate events, a hotspot nestled in heart of the City. HIGHLIGHTS: Dine in available, Bar available, Air Conditioned, Wi-Fi available, Valet Parking facilities & Bouncers and we also undertake group bookings starts from 25 Pax to 1100 Pax for the Corporate get-together, private parties, birthday parties, exhibitions, live events, banquet parties and much more.